Fr. John Lardas was raised in the parish of St. Nicholas Cathedral in Pittsburgh, Pennsylvania. Being tonsured a reader by Metropolitan Maximos while in high school, he was under the spiritual direction of the Dean of the Cathedral, Fr. Sarantos Serviou. He served as a Sunday School teacher, GOYA advisor and counselor at Camp Nazareth. Educated at the University of Pittsburgh with a Bachelor of Science in Education in 1987, Fr. John completed his Master of Divinity with honors at Holy Cross School of Theology in 1991.While a student at Holy Cross, Fr. John participated in the Ride for Life, which was a bike tour across the country to raise money for Cooley’s Anemia. He served on the Student Government, was the ecclesiarch for the academic year of 1989-90 and was the senior class president and lay-out editor for the yearbook. Fr. John worked at St. Basil Academy from 1991-95 where he served as Dean of Students and Chaplain. During his time at St. Basil, he was ordained to the Deaconate by Metropolitan Maximos on September 11, 1993 and to the Priesthood by Bishop Philotheos on October 3, 1993. He also served as the Orthodox Chaplain to the Orthodox Cadets of West Point Academy, and as Co-Director of Camp St. Basil. and YAL, teaching the 1st, 3rd through 5th grade classes at the William Spyropoulos Day School, Bible Study, Hospital Ministry, along with a very busy liturgical and sacramental life. In the year 1998, Fr. John was transferred to the St. Nicholas Parish in Troy, MI as the pastor. 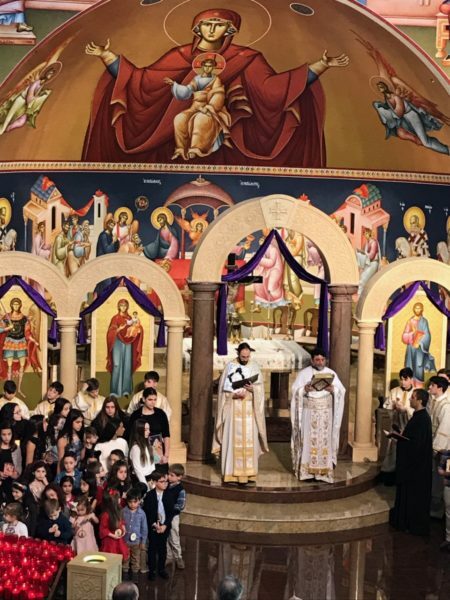 After two years, he returned to the St. Nicholas Parish in Flushing, NY where he was active in helping to establish the JOY soccer program for the Church as well as the children’s involvement in the Archdiocese Olympics for JOY and GOYA. In 2004, Fr. John was appointed by Archbishop Demetrios to be the spiritual father of the National Young Adult Conference.On August 15, 2005, Fr. Lardas was assigned as the Presiding Priest of the Cathedral of Sts. Constantine and Helen in Brooklyn. The presiding priest of the Cathedral has the overall spiritual responsibility for all aspects of the Cathedral community. Daily responsibilities include: maintaining the sacramental life of the church through the Divine Liturgy and all the other Mysteries of the church; teaching religion at the A. Fantis Parochial School; preparing sermons and lectures; doing administrative work for the proper functioning of the church; conducting Pastoral Care ministries such as catechism and visiting the sick; and of course in today’s technological society, trying to remain up to date with technology that helps expand the ministry of the church. Since serving at the Cathedral, working with the lay leadership of the community, Fr. John has been instrumental in helping to revitalize the youth programs by reestablishing the Sunday School Program, encouraging the development of JOY and GOYA and also beginning OPA (Orthodox Professional Association) for the Young Adults. For the Direct Archdiocesan District, Fr. John assisted in establishing the Emmaus Lecture Series sponsored by the Orthodox Priest of Brooklyn. He has served on the Camp St. Paul Committee and continues to serve by offering his service to the camp for a week. He is currently on the DAD Council and serves as the Vice-President of the St. John Chrysostom DAD Clergy Syndesmos. In January of 2015, with his sister ill with leukemia, Fr. John was a donor of his stem cells to his sister. By God’s grace and the gifted doctors, nurses and caretakers, his sister Constantina is perfectly healthy today. Fr. John is married to Eleni Paxos of St. Nicholas, Flushing, New York and they have three children, Vasilios, Maria and Kemon. Father Joshua Pappas joined the Archangel Michael Church community in August 2016 along with his wife, Presbytera Joanna. He is the son of Fr. Harry and Presbytera Kerry Pappas, who live and serve in Stamford, CT.
Fr. Joshua was raised primarily in a suburb of Minneapolis and attended college in North Carolina at Davidson, where he studied religion and economics. After graduating in 2008, he worked for three years at Liberty Mutual in White Plains, NY while continuing to discern a call to ministry that began in college. In 2011, he left Liberty Mutual to pursue a Master of Divinity at Holy Cross Greek Orthodox School of Theology in Brookline, MA. In 2014, he married Joanna Lialios who hails from Glenview, a northern suburb of Chicago. Holding a Master in Education and having taught high school for several years, Presbytera Joanna taught at a private Catholic school while Fr. Joshua finished his final year of seminary. Upon graduation from Holy Cross in 2015, Fr. Joshua and Prebytera Joanna moved to Thessaloniki where they spent 10 months learning the language and soaking up the spirituality and culture of Greece. Fr. Joshua was ordained to the Diaconate on August 7, 2016 by His Grace Bishop Andonios of Phasiane at the Church of the Archangels in Stamford, CT. Serving on the altar that day was his father, Fr. Harry Pappas, Fr. John Lardas, Fr. Nikolas Karloutsos, Fr. Evangelos Evangelidis and others. On October 9, 2016 he was ordained to the Holy Priesthood by His Eminence Archbishop Demetrios. Serving on the altar were Fr. John Lardas, Fr. Dennis Strouzas, Fr. Harry Pappas, Fr. 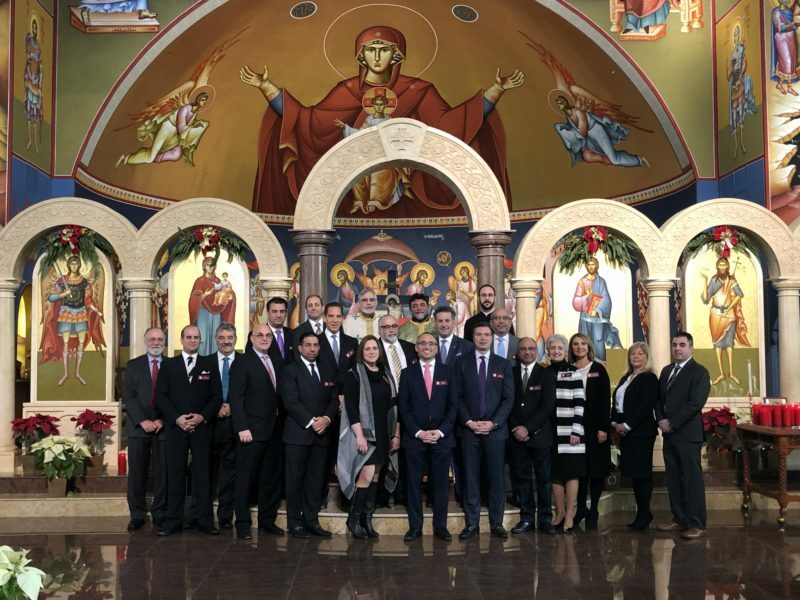 Sotirios Malamis, and other visiting clergy. Thankful for the Lord’s guidance and abundant love, they are excited to work and grow with the Archangel Michael community in the spirit of the Gospel. The Parish Council is the elected governing body of the church whose purpose is to work with the priests and members of the community to fulfill the goals of the parish. Seven of the twenty-one members are elected annually to serve a three-year term. For more information please contact: parishcouncil@archangelmichaelchurch.org. Fr. Dennis(Dionysios) was born in Chicago, Illinois to Peter and Mary Strouzas. He spent most of his early years in Chicago among family and friends. He graduated from Lane Tech, attended the University of Illinois and worked for Continental Airlines. He loved playing basketball and listening to music. He served in the altar at St. George Greek Orthodox Church where his grandparents, parents, brother, aunts, uncles and cousins were active members. His true love for Christ and the Church was nurtured from a very young age by his family and Fr. Rexinis, his parish priest. In some mystical way, he was drawn to Hellenic College and Holy Cross Theological School where he continued his education and received his Bachelor of Arts and Masters of Divinity degrees. While at Holy Cross Seminary he did field work with Fr. Kallistos Samaras (the late Bishop Kallistos of Blessed Memory) at St. Catherine’s Greek Orthodox Church in Quincy, Massachusetts. Fr. Kallistos became his spiritual father and mentor. Fr. Dennis and Presvetera Paula met at St. Catherine’s Church and were married at Holy Cross Chapel. Fr. Dennis was ordained to the deaconate at St. Catherine’s Church on July 1, 1973, and to the priesthood at St. Nicholas Greek Orthodox Church in Oaklawn, Illinois, on July 29, 1973. He served St. Nicholas in Oaklawn for four and a half years and St. Nektarios in Palatine, Illinois for six years. He also served as Youth Director and Camp Fanari Co-director for the Chicago Diocese. Fr. Dennis came to us at Archangel Michael Church on March 1, 1984 and has been our spiritual father for 29 years. His love, faith and compassion have touched all of us. We thank God for sending him to us. Fr. Dennis was elevated to the rank of Protopresbyter on April 24, 2015. He celebrated his final Divine Liturgy as Proistamenos on June 30, 2016 and retired as of August 31, 2016. Fr. Dennis and his family will continue to be a part of the AMC Community and we are blessed to have him and his family with us. We pray that the Lord will continue to bless Fr. Dennis and his family always.